King County Metro is pushing builders to invent a 60-foot battery-powered bus, to haul more people per vehicle than most transit agencies do. 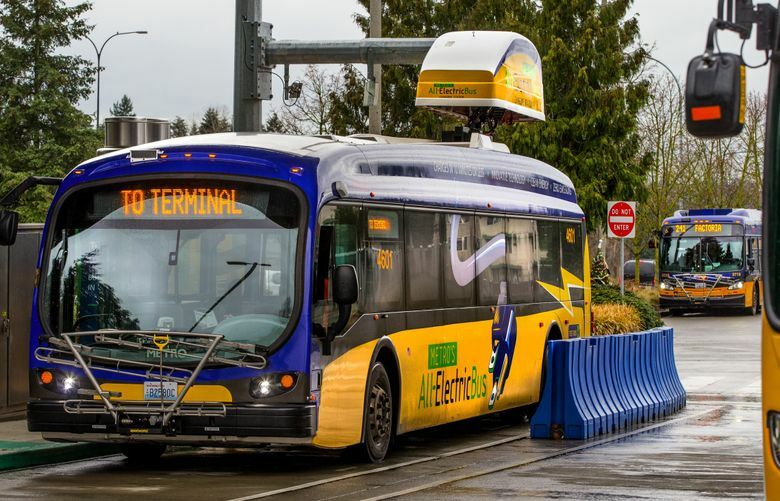 King County Executive Dow Constantine announced a deal Tuesday to buy 73 zero-emission, battery-powered buses from California-based Proterra, and his intention to buy 47 more from Proterra or its rivals by 2020. But can the industry build the articulated, 60-foot-long vehicles that carry the majority of Metro’s 400,000-plus daily passengers, including RapidRide, cross-city and suburban commuter routes? Metro’s letter of commitment to Proterra, dated Tuesday, calls for single-chamber 40-foot buses that Metro deploys for short local routes. “I challenge the industry to produce a 60-foot battery-powered bus that can meet our needs. When the industry and manufacturers produce that reliable longer coach at competitive prices, we stand ready to buy it,” Constantine said at a news conference in the Bellevue bus-maintenance base. Ryan Popple, CEO of Proterra, said the company already knows how to make an articulated battery bus, simply by installing more battery packs than a standard model. “It’s not a technical issue,” Popple said in an interview. “The 40-foot market is the largest market.” The 40-foot versions are prevalent in most transit agencies, and so far, the firm’s California clients haven’t asked for articulated buses, he said. But the market suddenly changed Tuesday with Metro’s 120-bus order, the biggest venture into battery buses in North America. Metro is the nation’s seventh-busiest public bus agency. Word of the bus purchase plan first surfaced Monday. Metro says it will pay $55 million for 73 of the low-floor, 40-foot buses, plus $6 million for charging stations, with most of the cost federally funded. The battery-powered electric buses are rechargeable, by 10-minute stops in a docking station, for 25-mile round trips. Last year Metro tested three Proterra buses refueling at Eastgate Transit Center for trips to downtown Bellevue, Overlake and Crossroads. Constantine’s order will include a few vehicles that cover longer distances and charge overnight. But with dozens of vehicles subject to future bid competitions, the agency can embrace whichever company first develops an extended rechargeable bus. Metro will continue to operate its wire-powered trolleybuses, using 174 recently purchased New Flyer vehicles, a mix of 40- and 60-footers with an operating life of at least 15 years. Someday battery buses will replace trolleybuses, but transit buyers ought to replace their fossil-fuel vehicles first, Popple said.